Are you looking for the CFR Index and Finding Aids for a specific year, but not sure where to find it? This tip should help you get started as we explain how to browse to the Index and Finding Aids and how to search for them from a specific year. Personal Bookmarking, Search by Subject across the Law Journals, Wiki…all now available in HeinOnline! You may be wondering, where's the "Tip of the Week"? Don't worry, that post will be coming later this week. I wanted to start off this week by touching on some exciting new enhancements that will be available with today's monthly content release. Later today you will begin seeing the MyHein bookmarking tool, the ability to browse and search by subject, U.S. State, or Country in the Law Journal Library, and the new HeinOnline Wiki. Each of these enhancements are outlined below with links, guides, and videos. Be sure to spread the news about these new enhancements with your students, co-workers, and other HeinOnline users. MyHein to be Released on Monday! A couple of weeks ago we posted a sneak preview of the new MyHein bookmarking tool. We are pleased to announce that this tool will be released on Monday, June 30th, 2008. MyHein will allow you to create and organize bookmarks and save search queries into your own personal research account. 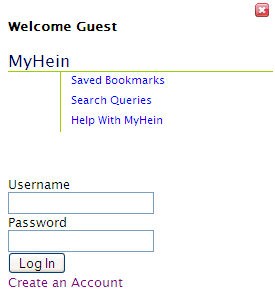 With the creation of a MyHein account, you can access your saved research anytime. You set up your own user name and password that only you will have access to. With the recent addition of the "Articles That Cite This Article" feature in the Law Journal Library, we have been able to gather data that gives us insight into the most cited journal titles and the most cited journal articles in HeinOnline. Below are our findings broken down by the top 30 Most Cited Journal Titles in HeinOnline, followed by the Most Cited Journal Articles in HeinOnline. We note here that the data was based on results using OCR technology, therefore some citations may not have been recognized or counted. Are you looking for a treaty that was signed on a specific date, or was entered into force on a certain date? In the Treaties & Agreements Library, the Treaty Metadata Search allows you to search across a number of metadata fields including treaty numbers, KAV numbers, parties, countries and even specific dates. When searching by date, you must use the YYYY-MM-DD format when inserting the syntax into the search box. Let’s take a look at an example. Stop by and see us at AALL! We'll see you in Portland! Are you going to be in Portland this year for AALL? If so, we invite you to stop by our booth and see us! The show is going to be exciting this year as HeinOnline has been busy over the past 12 months developing new features, new enhancements, and releasing new content. But that’s not all, there’s still more to come! Stop by and see us to find out what’s new and what’s coming. Check out our new interactive touch screens to learn more about new features, new content, and to catch a “Behind the Scenes” look at HeinOnline. 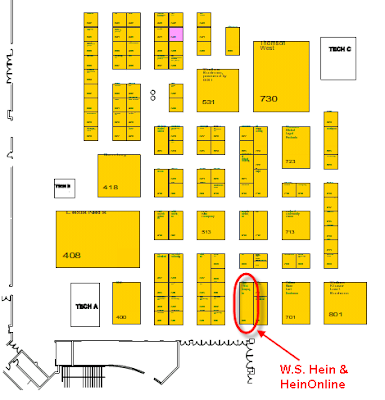 Our booth is #601. Below is an overview of the floor plan with our location outlined. Buffalo, NY (June 17, 2008) – William S. Hein & Co., Inc. and Paratext, LLC, announce an expanded cooperative program to augment access to Hein’s collections of historical legal periodicals through links from Paratext‘s 19th Century Masterfile. 19th Century Masterfile aggregates indexes, pointers and other finding aids to pre-1925 publications of all types, providing both detailed index citations, as well as links to full-text files where available. Paratext will now be adding 160,000 detailed index citations for historical legal periodicals to its 19th Century Masterfile database. These additions augment the 98,000 citations added last year. Last week’s Tip of the Week Post focused on proximity searching and finding two words that are within a certain distance from each other. If you missed that post, we recommend you take a quick look at it if you often construct complex searches. This week, we’re going to focus on Wildcard Searching. Wildcard Searching allows you to find various formations of a word, such as the plural or past tense of a word. For example, you may want to find references to the Clayton Act and all variations of the term interlock (interlocks, interlocking, interlocked). We have outlined some basic rules below for using wildcards, as well as a few examples. We are pleased to announce that MyHein will be released at the beginning of July! Yes, it’s true, we are ready to release this new enhancement for all HeinOnline users. We would like to thank all of the MyHein Beta testers for their valuable feedback and suggestions. We have integrated the feedback and suggestions into the development of this enhancement and hope you’ll find this to be a useful tool as you spend time researching in HeinOnline. Here are a couple of sneak preview screen shots of this new enhancement! With the live release, we will provide further documentation, help guides, videos and other training materials to help you get started. Do you often have a group of key terms that you want to search for but your terms don’t necessarily form an exact phrase? Or, when you search for the terms as a phrase you get no results? If this sounds like the kind of search terms you have, you may want to try conducting a proximity search.